The milieu of spatial freedom can be noisy. If that were not so, nothing would be heard or written in tabula rasa in corde suo, “the blank slate of the heart” so to speak. 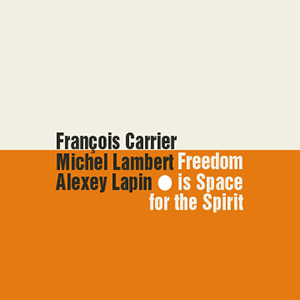 Fortunately, where there is sound, there is also silence, more so in this music by saxophonist François Carrier, drummer Michel Lambert and pianist Alexey Lapin. Each musician leads this performance, which is surprisingly formed and visceral despite suggestions of the formlessness of “Space” and “Spirit.” Another curiosity in the presentation is that the music has five distinct parts (one would have expected a continuous musical flow); each reaching the gossamer fragility of the best of free-improvised music. The music is imbued with a sense of languor and immediacy and richness in abundance in saxophone and piano parts. That’s not to say that textures clot: flecks of melody flicker in the ear, enticing and disappearing in a moment; the balancing that makes that possible is admirable and it has much to do with the incessant tattoo of the drummer’s alternately placid and volcanic intercessions. The musicians’ work comes off in rather special ways. In Keep Calm, for instance, the saxophone, caustic and stark, smacks at the winging, indeterminate piano and in Nevsky Prospect, drummer and pianist come up against the saxophonist’s snarling, nasty layering in the climactic, dying sections of the piece. Everywhere in the program, are muscularity and the mystery of Space and Spirit in abundance.